As far as I’m concerned, we’re living in the true golden age of comics. 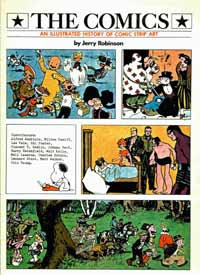 In addition to comics-based properties dominating movie grosses, many classic comics and comic strips are being collected in their entirety in quality editions for posterity, and books both for casual readers and serious scholars are plentily available about the history and phenomenon of the medium and for those interested in comics-related careers. This wasn’t always the case. When I first became seriously interested in cartooning and comics history, books on these subjects were not so ubiquitous or easy to come by. As an adolescent, I spent a great deal of time scouring bookstores and libraries for books on the subject (partly to validate my enthusiasm) and, in turn, went through their bibliographies to track down more. Over several blogs I plan to talk about many of the early books that introduced me to the rich history of the medium. Some of them I own, others I borrowed countless times from my local library to pore over. They are the foundation of my knowledge about the history of comics, and some of them remain classics in the field. I discovered this book in the early 1970s at my local branch of the New York City Public Library, and it was one I borrowed frequently. One of the earliest books to provide a comprehensive history of comics to date at the time of its publication, it introduced me to the founding days of American cartooning and the newspaper comic strip form, on which the whole subsequent comics industry was built. It was in these pages I learned about the earliest history of the medium, and was first introduced to the great newspaper strips, including those that would serve as my main inspirations like Milton Caniff’s Terry and the Pirates. 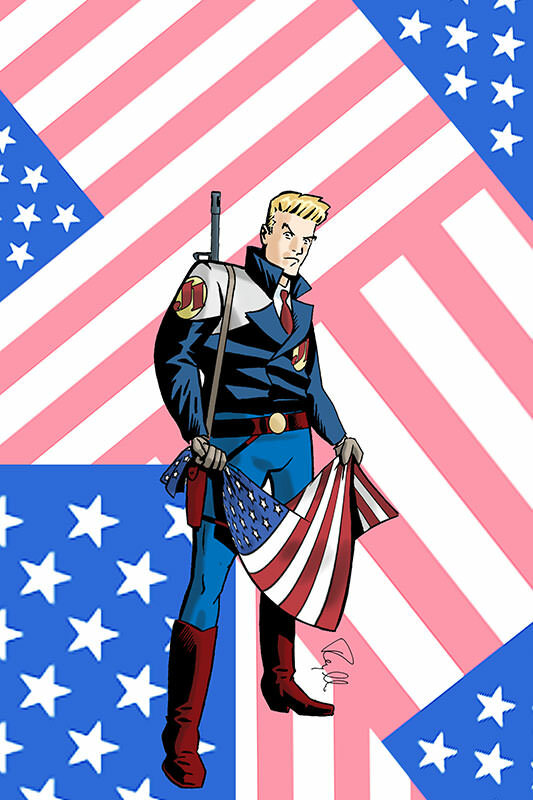 Given its broad coverage of the subject, Comic Art in America only provided a few examples of the strips covered in its pages. So while I was thrilled to be given a glimpse into the artistry and storylines of the strips, being given a one-day excerpt of an adventure strip also was quite a tease. I realize now that the exoticism and sense of adventure implied in these small excerpts served to fuel my own imagination as I filled in the blanks with my own mind. It wasn’t until many years (and decades) later that I would finally see the context of many of these excerpts when the full collections of many of these strips began to be released. When this book was originally released in 1941, it was among the first to provide a serious overview of comics, primarily consisting of first hand “oral histories” from artists, with a chapter devoted to individual cartoonists and their work. Many subsequent historians—including Becker—drew extensively from Sheridan’s work (as did many who, in turn, referenced Becker). This book was re-released in 1973 as Classic Comics and Their Creators, which is the edition I own. I remember asking my parents to mail-order this book for me when I saw an advertisement for it. 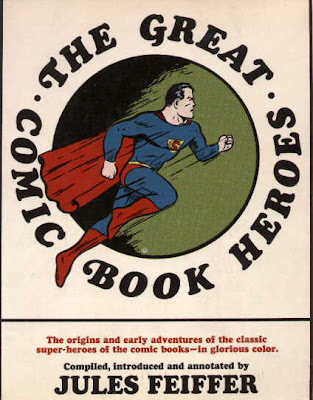 Though readers will find featured here the usual giants of the time such as Caniff and Alex Raymond, also included in the book are less well-remembered cartoonists, as well Superman creators Joe Shuster and Jerry Siegel, though the focus primarily is on the Superman daily adventure strip. 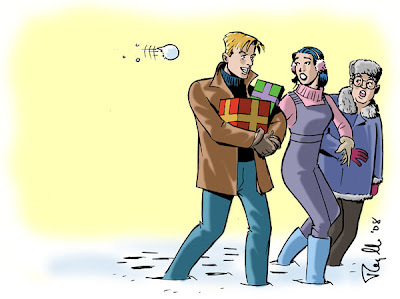 Below is the finished image for my WCG Comics holiday card. To see it with the holiday message visit the WCG Comics website. Every year I also produce a personal holiday greeting card featuring myself and my family. Below is the image for this year's card. My wife mentioned that she loves the fact that each year's card shows the children getting older while we haven't aged!